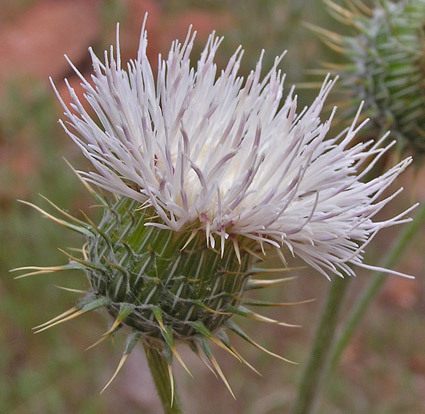 See Cirsium trayci for distinguishing between C. neomexicanum, C. trayci, and C. undulatum. Semi-desert, foothills. Shrublands, openings. Spring. Above Yellow Jacket Canyon, Canyons of the Ancients National Monument, May 8, 2009. 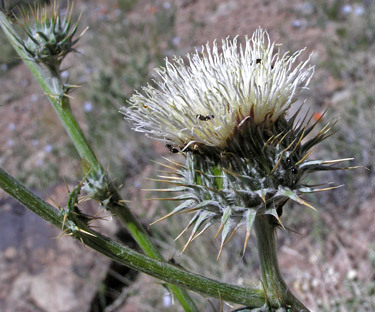 Cirsium neomexicanum is a common site in the arid high desert country of the Southwest. It grows to 60 inches tall from a taproot. 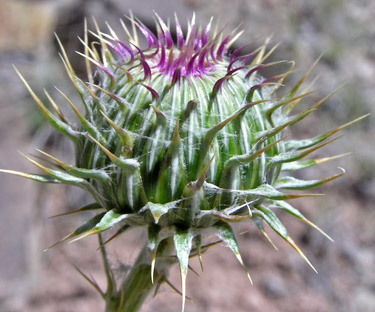 Its leaves become progressively smaller higher up the stem until finally they are just minute, spiny bracts. C. neomexicanum "has long been confused with C. undulatum with which it shares the grayish tomentum, large heads, and tall stature. They have been separated previously on the basis of glandular development of the dorsal ridge; a feature which is, unfortunately, not diagnostic". Asa Gray named C. neomexicanum in 1853 from a specimen collected by Charles Wright in the Organ Mountains of southern New Mexico. near Hovenweep Canyon, May 17, 2004. The cobwebby hairs at the base of the phyllaries on the surface of the involucre seem to be one diagnostic characteristic of this species. The shape of the phyllaries is even more accepted as diagnostic. 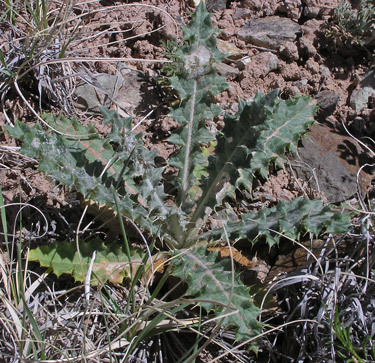 Most botanists agree that the reflexed (bent backward) tips of the phyllaries and the spines separate this species from C. trayci and C. undulatum. Notice also that the spine-like tips are a different color from the much thicker and green base of the phyllaries. Utah flora expert, Stanley Welsh, indicates that this is a primary characteristic separating two varieties of this species, the one shown is C. neomexicanum variety utahense and the other with involucral phyllaries green throughout is C. neomexicanum variety neomexicanum. John Kartesz, ultimate authority for plant names on this web site, feels that research does not support the division into varieties. Basal leaves can be 10 inches long and they are quite hairy underneath, moderately so on top.